For some of us, we just can’t get enough of camping. Whether or not it’s the summer or full on blizzarding, we want to be out there adventuring about. But winter camping has it’s own challenges. Staying warm is always priority number 1. Let’s dive into some ways to fight the cold and still enjoy a trip in the snowy wonderland. Shelter’s the most important thing when camping, whether you bring a tent or a hammock, you’ll need to learn how to stay warm in it. Of course, we’ll always choose a hammock over a tent. When temperatures drop below freezing, a sleeping pad in your hammock may not be enough insulation. Especially if you like to spread out and your knees and elbows come off the pad. You’ll have a pretty chilly night without proper insulation. In the winter, we recommend using an underquilt. They’re light weight, more comfortable (you get to sleep directly on the hammock), and provide more coverage. You can choose from either synthetic or down when shopping for underquilts. Synthetic is a more affordable option, but will be heavier and less compact and portable than the down alternatives. For a durable and lightweight synthetic option check out Arrowhead equipment’s underquilts. For a trustworthy down option, we like the quilts from Hammock Gear. Learn more about alternative ways to insulate. While hiking in the winter, your boots and socks are bound to get wet. Leaving them out overnight is a grave mistake. You’ll have to wait all morning for them to thaw out, or pour hot water on them until they melt – and even then, you’ll have wet shoes! One way to prevent this annoyance in the morning is to keep your shoes in a plastic bag and sleep near them at night. They can stay with you in the hammock or you could even keep them in your sleeping bag. Another thing you’ll want to keep close to you is your water bottle. There’s nothing worse than waking up to find your water bottle frozen, along with all the lakes and streams being frozen too. Before you go to sleep, consider heating up some water and filling up your bottle. You can then use your hot water bottle to warm up your sleeping bag before you jump in, giving you a cozy and warm hammock to quickly fall asleep in. 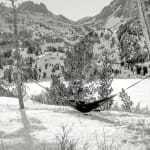 What kind of hammocks work best in snow? 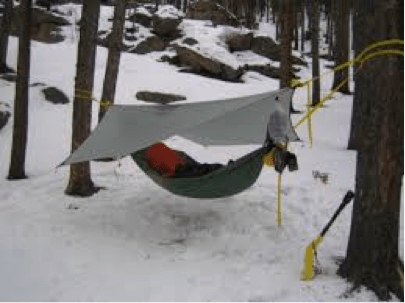 With proper insulation and tarp coverage, any camping hammock can work well in the winter. We’ve taken a Serac ultralight hammock out around 10 degrees overnight. With the adequate bottom insulation hammock (we used a custom underquilt from Hammock Gear or learn to make your own), we stayed warm throughout the night. It did begin to snow that night, but we were prepared for this as well. 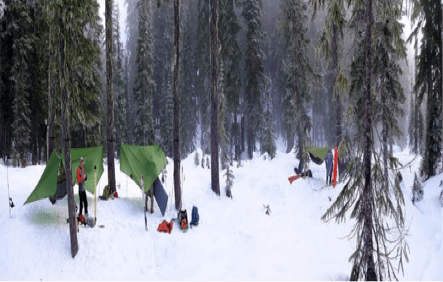 We had set up tarps over our hammocks to keep the snow and the wind out and slept comfortably all night. 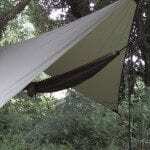 Learn more about the different types of hammock tarps. The Hennessy Expedition Asym hammock is also a good option. This option comes with a rainfly, which they’ve upgraded recently for more coverage. 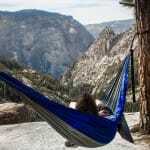 The Expedition hammock also boasts a thicker nylon shell, helping to protect you from the elements. Don’t be afraid to adventure out during the winter. The world is a different place when covered in snow. But be careful, and don’t forget to stay warm and dry. 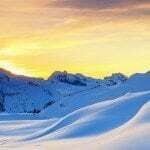 This entry was posted in Staying Warm and tagged 4 season, Backpacking, Camping, cold, hammock, Hammocks, insulation, winter camping.